My most recent trip turned up a cute little robin figurine, a 1980 "Worlds Greatest Grandma" Glasbake coffee mug. These two items are perfectly fitting. During adolescence years my grandmother & I used to have a contest on who could spot the most robins before May. Of course, we counted on each others honesty not to cheat. & the sticker is also fitting as she always thought I was "one cool kid". Seeing a robin now is quite odd. I was in Whitby for Easter weekend (didn't get to visit the This & That flea market though...) & spotted a robin. I acted like I did when I used to spot a blue jay or cardinal when robins where an everyday thing. You rarely spot a robin in downtown Toronto. But there is a swan, a loon & some ducks who hang out in the harbour. These items were found along with a cute little (& I mean little) flower pot that says "Listen to the flowers" on it at Value Village. I've got so much junk lying around that I couldn't find it at the time of the photography of the other items I picked up that day! What is Glasbake you ask? The McKee Glass Company was founded in 1843 (As McKee and Brothers Glass) in Pittsburgh, PA. The company was purchased by Jeannette Glass in 1961. McKee Glass not only made items under its own name but also produced under the "Glasbake" name. United States $1 Bill Giveaway! This is my celebration of how ridiculous blog giveaways have become. Yes, there are definitely some amazing, interesting giveaways out there, but c'mon, coupons for BOGOF (Buy One, Get One Free) yogurt? It's laughable. This thread is about thrifting, also about being thrifty, so this is giving you a chance to stretch that dollar! Now is your chance to bank it in. 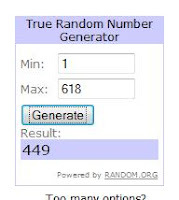 I am giving away 3 - yes, you heard right - 3! United States $1 Bills! Open to residents of the USA & Canada. Contest ends May 9th at 11:59:59PM. Winner will be chosen by random.org & emailed. 01. Comment with what you would buy with your $1 bill. I've got some bad news - the antique stores were all a bust! Didn't purchase one thing! I wasn't expecting to end up on Antiques Roadshow (although, I can sit & watch the show for hours), but it would have been nice to find at least one treasure. I stopped at Value Village afterward, but, it too, was a bust. I couldn't concentrate looking around since the place was packed with very pushy customers. Maybe they were all buying stuff for their antique shops down the road? hmmm? Anyways, let's see what the world holds in the future. Here's an oldie, but a goodie! Alright, like I said, an oldie but a goodie! Bought this over a year & a half ago for 99cents at Goodwill. Has a cushy, soft cover & has never been written in! Family & friends are important, yes, but so is thrifting. It'd be perfect to have family members who were visiting for the weekend be into thrifting, but you know, those are the breaks! Luckily, I have tomorrow (Monday) off & I am hitting up some junk stores on the east side that I've never visited before. Hopefully the store holds some wonders that end up on my shelf. I found this really cute antique shop last week just on the harbourfront. I am imaging their prices to be insane since they have a lake view. They have this very nice piece in their window that I'm totally interested in. Wonder how much? Went today, closed. It's right next to a dollar store that I have been going into for over a year. The wife claims that he has known about it, but never said anything! That's what he calls love? Pfft! I also feel the need to say, I submitted one of my found photos to Awkward Family Photos. Can you guess which one? I must say, I really do like this birds hat, she has great fashion sense! & she only cost me 49cents! Sadly, one of her wings is chipped. I have to say, work gets in the way of lots! My manager has been away on a cruise so I have been opening 5 days a week. Listen, I'm all down for the 5 days a week, but I'm not a morning person. I love to stay up late, especially since the wife gets home quite late from work (2:30AM - 3:00AM) & I like to stay wide awake with anticipation. I will bring you more things - you wait. I'm doing a big project during my extra moments. It's called organization. I have taken photos of my bookshelves before & will post them with after photos in the future. I guess I am on a bowl streak. I found these today at Funky Monkey. My first purchase from the shop. I have to say that that $1,7000 refund actually has paid off in some decent finds. 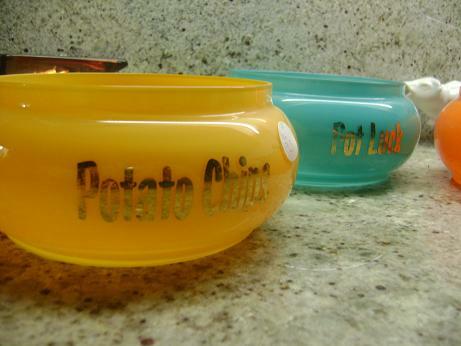 You know, it's hard not to plan a party around these bowls. My only question is: what goes into "pot luck", or do we even want to know? keys? Here are some other shots. The set cost $25 flat. 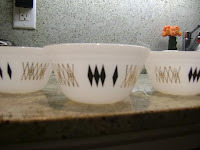 I am thinking it's pretty decent price considering it's a "retro" shop & a Value Village would pretty much mark these bowls up to the same price - or higher. Remember that Beatles record that was $29.99 in Niagara Falls? & then I bought The White Album for a buck a Goodwill? Anyways, enjoy the photos. Let me know what you think should go into the pot luck bowl. ps: do you know what era these bowls are from? i'm thinking late '60s, early '70s. I have been looking for a suitable pot to start candle making. 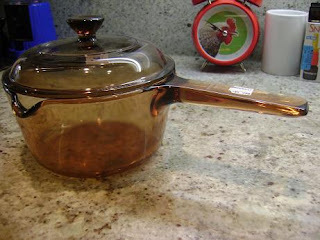 I started my search at quite a few thrift shops, but surprisingly, I did not find anything suitable enough as everything I found would scratch my stove top. Decided to stop in the Salvation Army on the way to Wal-Mart to buy a pot. I usually don't stop at that Salvation Army. It's hot in there & I've never found anything worthwhile except a Simpsons Nintendo game that I purchased for the wife, but he never plays. Not to mention he never plays the Xbox 360 I got him for Christmas. No his Super Nintendo or PS2, but that's besides the point. I found this lovely Pyrex pot! It couldn't have been a better, fitting find! 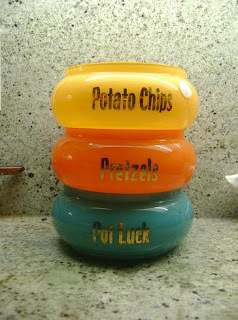 I had never though about how I was going to pour the wax into the candle molds, but this sucker has got a spout! Perfect! I also bought 2 gigantic candles. One on clearance at Wal-Mart & the other, a sweet french vanilla for $1.99 at Value Village, which had a price tag of $24.99. I was complimented on it while in line. Anyways, I'm going to start by melting old candles down & getting the hang of it.. trying to think up candle company names, lol. Any ideas that you won't claim copyright infringement on later? Oh, it was $5.99, btw. My recent trip was pretty decent. I bought these 4 Federal bowls below, all great condition. They were priced a bit high for my liking, $1.99 a piece, but I thought they would go great with my larger Federal bowl if we happen to have a party shortly. 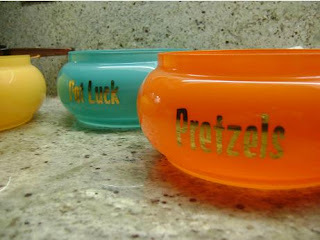 On a sad note, I had seen these 4 glasses that would have went absolutely perfect with these bowls & had considered buying them... but, alas, I didn't. 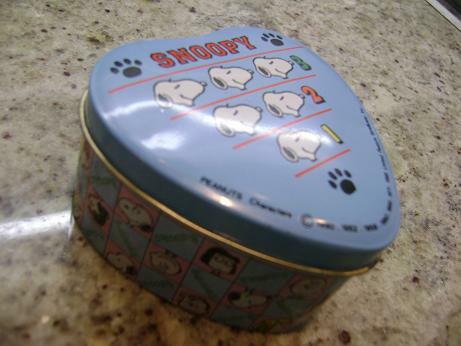 I also came upon a little Snoopy (Peanuts) heart shaped tin made in 1985 by United Feature Syndicate Inc. 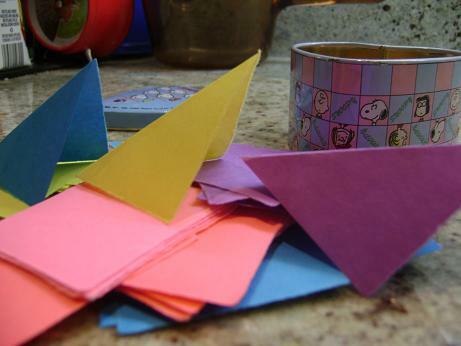 Funny thing is, it had about 50 small, torn pieces of paper inside that were all folded down the middle. I paid 99cents for it. They also had a Hello Kitty heart shaped tin from 1986... it was 49cents, but I didn't think I needed it. I will, if all goes right, be visiting some antique & junk shops on the east side of the city tomorrow. Hopefully find some nice stuff. You'll definitely hear about it..
Top 7 Things I Won't Buy At A Thrift Shop! Top 7 Things I'd Never Buy In A Thrift Shop! 07. Shoes. My sweaty feet don't want to be in a pair of shoes where another sweaty pair of feet have laid their toes, probably on a daily basis. The shoes are molded to their feet & in my non medical opinion, used shoes don't do a body good. 06. Kitchen appliances. 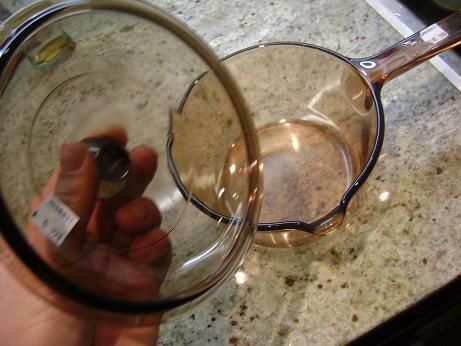 Have looked into buying a few at the thrifts & always found extreme residue of foods inside. Cleaned, sanitized it doesn't sound like something I want to be eating my food out of. 05. Candles. I used to be all up for buying candles at the thrift until the last bunch had the wick go up in flames & smoking like Eyjafjallajokull. 04. Beauty products, toiletries. I see opened bottles of this stuff on a continuous basis. Why? Who would buy them? One frequent item I see is open boxes of women's feminine products, seriously? 03. Books written specifically to be brought into the bathroom. Yes, all books could be brought into the bathroom & have whatever done with them, but the thought of a book made to be in the bathroom & most likely sat in the bathroom & was read by many & probably in the room when being flushed with the seat open... not something I want in between my hands for an extended period of time. 02. Bathroom mats, toilet covers. I don't like our bathroom mat as it is, they're gross! What would be grosser is owning a used one. 01. Obviously, undergarments. No explaination should be needed. 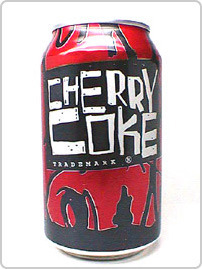 I promised some more free Coke Rewards codes for my US readers.. was able to pick up some more bottles of Cherry Coke. The only thing I ask in return is that you post when you have used them so other readers don't attempt to add them to their account after they have already been used! Thanks! Unfortunately they were right - it's a battlefield out there. All the thrifts have been BUST, but I have high hopes for the future..
For you, my readers, I have a thrifting tip. As a thrifter, you get excited when you find that obscure 1918 ragtime vinyl or that Dance Mix '92 Japan import disc or even a copy of the Richard Simmons workout, but there are a few things you want to look for when buying media (vhs, cd, vinyl, cassettes) from a thrift store. 1. Always open the case to check that the item inside is the one described on the box or sleeve! Thrift store workers don't have the time, nor do they want to bother, to make sure the right one is in the right box or sleeve. Also many people are unorganized! An unorganized person donating media items to the thrifts is a recipe for disaster! Once you find out if the item is the right item, if it's a disc, turn it over & check for scratches or marks that may effect playing - same goes for vinyl. With a vhs, you want to flick over the tape cover (there is a little switch like thing on the side) to make sure that the tape is intact. It can often be broken or missing. Always double check your cassettes tape too. Take a quick peak in through the little window in the cassette to make sure the tape is not all crumbled. CD case broken? No big deal. Many independent record shops that sell used discs have plenty that they usually are giving away free at the door. Or you can opt to buy one for a buck or more at one of those chain shops. Curious about a disc or cassette & don't want to take the chance on spending your hard earned $ on it if it's not your thang? Most good thrifts have an electronic testing area complete with plugs & an abundance of electric cords. Take it over there, give it a listen. I always test with my own earphones in as to not to disturb the other shoppers, but that's me, I'm polite. Most vinyl is cheap, but if you don't want to take the chance, you don't want to take the chance - right? You can test it the same way, but it will be a lot more effort. Finding a record player with a good, working needle in a thrift isn't as easy as it used to be. This product first came to my attention when I was browsing the shelves of a natural health shop in Kesington Market. For the last several months I have embarrassingly enough developed a snoring problem. I think it began when I got my nostril pierced, but what do I know? I swore when I was younger I got Meningitis from a plum. So, the wife took a photo with his Blackberry so I could so some research online. I hadn't found many reviews online & the ones I had found were all conflicting, some people it worked for, some it did not. After awhile I had forgotten all about it.. until I saw the product in the clearance section at Winners. Nice, huh? It had a price of $6.99. Bought a bottle & gave it a try. It works! We were at the point that the wife couldn't sleep, at all, he'd go nights without a wink of sleep. He'd also wake me up multiple times & we both because absolutely exhausted. They have different products, which are supposed to work better when joining them all together, but may work just fine alone. In my case, the product works! I do not spray it right before bed like the bottle says, but I do spray it between 30-45 minutes before bed. Out of the 7 nights I have been taking it, I have snored once. That one time I had taken the spray a couple minutes before bed. If you are a bed sharer of a snorer, I recommend giving the product a try. $20 is work a great night of sleep, trust me. Sleeping with a snorer, so I've heard, can be absolute bed hell, so, invest, give your partner a good nights sleep. Look at the beautiful Ms. Hands, cut kit eh? Today she's modeling a vintage fake flower that cost her beloved owner 99cents at Goodwill many moons ago. 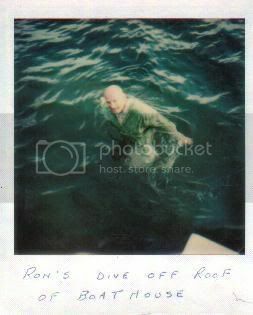 Don't remember when this was found, but I do remember it was found with a few other polariods. With the weather warming here in Toronto, I thought a swimming man would be fitting. Happy Easter! Goodwill has never had such good deals on VHS, DVD, CD & vinyl as of late. A buck for each, but $2 for DVD (wouldn't buy one anyways..). At a buck each I got Sid & Nancy (which I bought for Courtney Love's part as Gretchen), Little Darlings (sounds wholesome, never seen it) & Pee Wee's Big Adventure (because I have a thing for Pee Wee Herman). Only able to watch them in the bedroom, but either way they'll look great on my shelf! I had never heard of the "Don't Sweat The Small Stuff" book until I saw it in a box for 99cent books. Thought it sounded like a positive self help book, so I bought it. I've already been able to incorporate one of it's tips into my daily life. The: is it going to matter in a year? thing. When my boyfriend chews gum like a cow, will it matter in a year? No, but really, it sure matters when it's happening & I usually flip. But when I ask myself if it will matter in a year, I tell myself, "no, it won't. It won't even matter in an hour from now." So there's that. In the book department I also bought a Leo (yes, I am the greatest sign of them all!) personal horoscope book. They have not been right at all.. disappointed. Told me I would not be made a foot on April Fools day, but alas, I was. In the vinyl department I picked up The Beatles' 'White Album'. I picked it up since it was selling for $29.99 @ Value Village (I know eh?). In line a woman was like, "WOW! The White Album!" I told her, ya, I never listened to it before & for a buck, why not. She laughed, called me young & told me to enjoy it. She was buying a pair of shoes & a couple t-shirts, if you were curious. Very nice woman she was! The, ah, `rooster` clock. 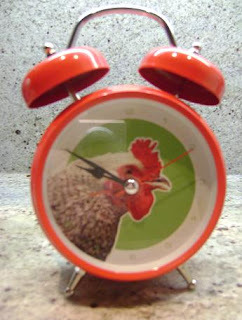 Yup, you guessed it - when the alarm goes off it sounds like a rooster! It cost me $4.99 @ Value, never used. I can tell it was never used as it still had styrofoam in the battery pack. Also, both of these pins for $0.99. 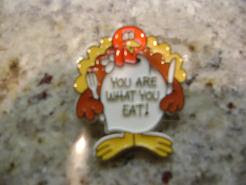 The turkey one, `you are what you eat`, is by Hallmark & has a copyright of 1983. The New Kids On The Block pin is self explanatory. Why I needed it I will never know. Just incase you misplace yours or it suddenly falls off or is bitten off. Now I own one of everything, btw. $1.99 @ Value Village. You can see the damage done by the staff shoving it into a tiny, tiny bag. Even though it`s ruined, I just couldn`t say know. 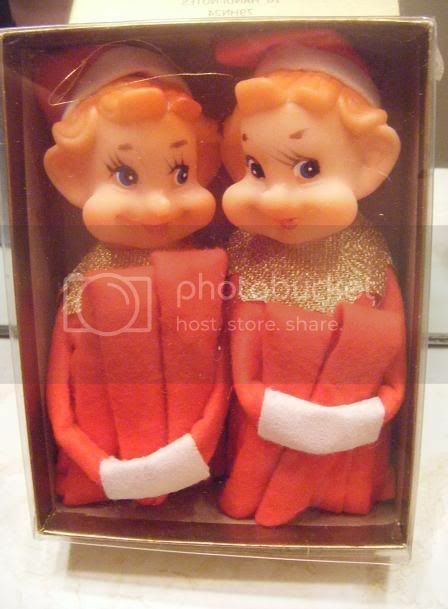 This is one of those items that you had been searching for for years, but didn`t even know it! On a sad note, today at Goodwill a woman had her purse stolen & from what I overheard from staff, it happens a lot. I was standing nearby because I was going to report a woman who trapped another woman in a bathroom (too odd to explain). & the winner is... K A R A * * *! Your comment on my South Street Burger Co. won you the gift code. I`d like to thank everyone for making my first international giveaway a success! I now love you all! Buy me something nice, K A R A * * *! 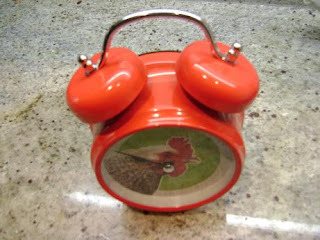 Have a great thrifty Easter weekend, I`m sure you`ll hear from me. You know those days, the ones you think are one of the worst in your whole life? I was having one of those the other day. Won`t go into great detail, but, left work, got on the crouded, crouded subway, got off to go to the docs office - didn`t have an appointment, just a walkin in the same office my family doctor is at. Wasn`t sure what time they were closing, so was in quite a hurry. Was on the last two pills the night before, so missed a dose that morning & if I didn`t make it in time... I`d be without meds for a day & a half - not good. Anyways, the docs is in a little mall along with a Goodwill. Perfect, eh? I usually check in at the docs office & while everyone else is waiting, I go to the thrift. So, speed walking through the mall, angry as ever, not sure if i was gonna make the docs, I look into the thrift window & right next to the window atop a random table is a vinyl I`ve been looking for for over 2 years! I could of easily bought it off eBay, however, I like the hunt. That made my week. Angry went out the window. I literally ran into the shop, purchased it & ran back out to go to the docs. Checked in, with a sigh of relief saying to myself, ``looks like we made it!``, & went back to the thrift. The record was a buck! It`s a double vinyl & it`s in prestine condition. I couldn`t have been more happier. 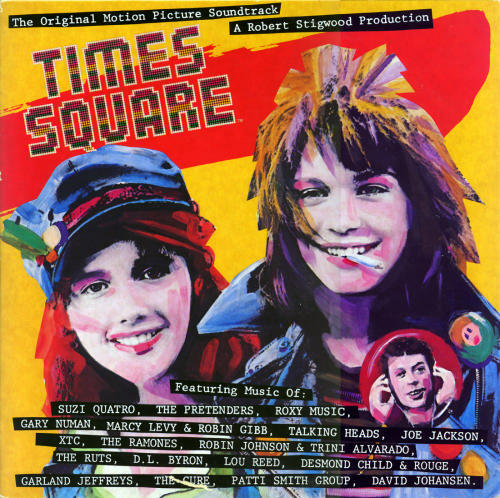 If you didn`t know, Times Square, which is a cult film - especially among the gay, lesbian & trans community, features Tim Curry, Robin Johnston & Trini Alvarado. 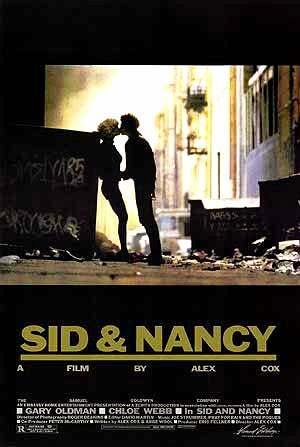 The movie was inspired by a diary the director, Allan Moyle, found in a second hand couch! The diary was from a mentally disturbed woman that featured words & drawings of her life on the streets in New York City. The story who about two NYC girls who meet in a hospital, escape together & form a punk band who then have NYC at their heels, begging for more. Great film! Check it out! It was Robin Johnson`s first film, I thought she did great! He carreer ended years later with only a few films under her belt. So, bought at Goodwill for $1, but in my eyes worth so much more.